While the health effects of our environmental changes are not fully understood, it is evident that there are many everyday chemicals that are harmful to our health. Every day, we are exposed to hundreds of toxic chemicals from sources such as pharmaceuticals, pesticides, packaged foods, household products, and environmental pollution. As we have become more exposed to chemical-laden products and to toxic chemicals in food, air, and water, we have been confronted with an accelerating rate of chronic illnesses like cancer, heart disease, chronic fatigue syndrome, chemical sensitivity, autism spectrum disorders, AD(H)D, autoimmune disorders, Parkinson's disease, and Alzheimer's disease. 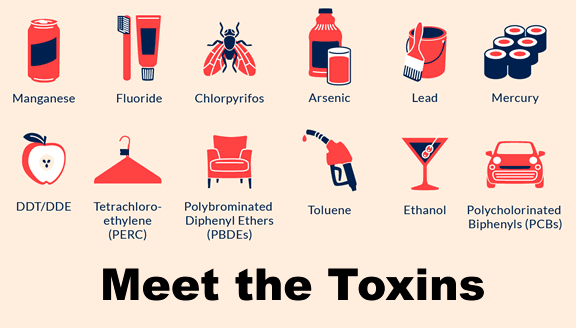 These are perhaps the most widespread group of toxic chemicals found in our environment. Phthalates are commonly found in aftershave lotions, aspirin, cosmetics, detergents, foods microwaved with plastic covers, oral pharmaceutical drugs, intravenous products prepared in plastic bags, hair sprays, insecticides, insect repellents, nail polish, nail polish remover, skin care products, adhesives, explosives, lacquer, janitorial products, perfumes, paper coatings, printing inks, safety glass, and varnishes. Phthalates have been implicated in reproductive damage, depressed leukocyte function, and cancer. Phthalates have also been found to impede blood coagulation, lower testosterone, and alter sexual development in children. Low levels of phthalates can feminize the male brain of the fetus, while high levels can hyper-masculinize the developing male brain. Benzene is an organic solvent that is widespread in the environment. Benzene is a by-product of all sources of combustion, including cigarette smoke. It is released by outgassing from synthetic materials and is a pollutant released by numerous industrial processes. Benzene is an extremely toxic chemical that is mutagenic and carcinogenic. High exposures to benzene cause symptoms of nausea, vomiting, dizziness, lack of coordination, central nervous system depression, and death. It can also cause hematological abnormalities. Pyrethrins are widely used as insecticides. Exposure during pregnancy doubles the likelihood of autism in the child. Pyrethrins may affect neurological development, disrupt hormones, induce cancer, and suppress the immune system. Xylenes (dimethylbenzenes) are solvents found not only in common products such as paints, lacquers, pesticides, cleaning fluids, and fuel and exhaust fumes, but also in perfumes and insect repellents as well. Xylenes are oxidized in the liver and bound to glycine before eliminated in urine. High xylene levels may be due to the use of certain perfumes and insect repellents. High exposures to xylene create an increase in oxidative stress, causing symptoms such as nausea, vomiting, dizziness, central nervous system depression, and death. Occupational exposure is often found in pathology laboratories where xylene is used for tissue processing. Styrene is used in the manufacturing of plastics, in building materials, and is found in car exhaust fumes. Polystyrene and its copolymers are widely used as food-packaging materials. The ability of styrene monomer to leach from polystyrene packaging to food has been reported. Occupational exposure due to inhalation of large amounts of styrene adversely affects the central nervous system, causes concentration problems, muscle weakness, tiredness, nausea, and irritates the mucous membranes of the eyes, nose, and throat. Organophosphates are one of the most toxic groups of substances used throughout the world. They are sometimes used as biochemical weapons, but are most commonly used in pesticide formulations. Organophosphates inhibit cholinesterase enzymes, leading to overstiumulation of nerve cells. This can cause sweating, salivation, diarrhea, abnormal behavior, aggression, and depression. Childen exposed to organophosphates have more than twice the risk of developing pervasive developmental disorder (PDD), an autism spectrum disorder. A study done in the San Francisco Bay area found that in California agricultural areas, children born to mothers living within 500 meters of fields where organochlorine pesticides were used were more than 6 times more likely to develop autism than children whose mothers did not live near such fields. ASD risk increased with the poundage of organochlorines applied and decreased with distance from field sites. Maternal organophosphate exposure has been associated with various adverse outcomes including having shorter pregnancies and children with impaired reflexes. MTBE and ETBE are gasoline additives used to improve octane ratings. Exposure to these compounds is most likely due to groundwater contamination, and inhalation/skin exposure to gasoline or its vapors and exhaust fumes. MTBE has been demonstrated to cause hepatic, kidney, and central nervous system toxicity, peripheral neurotoxicity, and cancer in animals. Since the metabolites of these compounds are the same, ETBE may be similarly toxic. This is a very common herbicide that was a part of Agent Orange--a product used by the United States during the Vietnam War to increase visibility for war planes by destroying plant undergrowth and crops. Today, it is most commonly used in agriculture on genetically modified foods, and as a weed killer for lawns. Exposure to 2, 4-D via skin or oral ingestion is associated with neuritis, weakness, nausea, abdominal pain, headache, dizziness, peripheral neuropathy, stupor, seizures, brain damage, and impaired reflexes. 2, 4-D is a known endocrine disruptor, and can block hormone distribution and cause glandular breakdown. Acrylamide can polymerize to form polyacrylamide. Polyacrylamide is used in many industrial products and processes such as plastics, food packaging, cosmetics, nail polish, dyes, and treatment of drinking water. Foods and cigarette smoke are also two major sources of exposure. Acrylamide has been found in foods like potato chips, French fries, asparagus, legumes, nuts, seeds, beef, eggs, and fish. Asparagine, which is found in these foods, can produce acrylamide when cooked at high temperatures in the presence of sugars. High levels of acrylamide can elevate a patient's risk of cancer. In addition, acrylamide is known to cause neurological damage. This chemical is used in the production of rocket fuel, missiles, fireworks, flares, explosives, fertilizers, and bleach. Studies show that perchlorate is often found in water supplies. Many food sources are also contaminated with perchlorate. Perchlorate can disrupt the thyroid's ability to produce hormones. The EPA has also labeled perchlorate a likely human carcinogen. Patients exposed to a high level of perchlorate can use a reverse osmosis water treatment system to remove the chemical from their water supply. This is a chemical made from the processing of petroleum. It is often a colorless gas with a mild gasoline-like odor. This chemical is typically used in the production of synthetic rubber. 1,3 Butadiene is a known carcinogen and has been linked to increased risk of cardiovascular disease. Individuals that come into contact with large amounts of rubber (e.g. car tires) could absorb 1,3 Butadiene through the skin. The increased use of old tires in the production of crumb rubber playgrounds and athletic fields is quite troubling because children and athletes may be exposed to toxic chemicals this way. Ethylene oxide is used in the products of many different industries including agrochemicals detergents, pharmaceuticals, and personal care products. Ethylene oxide is also used as a sterilizing agent on rubber, plastics, and electronics. Chronic exposure to ethylene oxide has been determined to be mutagenic to humans. Multiple agencies have reported it as a carcinogen. Studies of people exposed to ethylene oxide show an increased incidence of breast cancer and leukemia. Caution is needed with ethylene oxide because it is odorless at toxic levels. The GPL-TOX profile tests for Tiglylglycine (TG), one of the most specific markers for mitochondrial disorders resulting from mutations of mitochondrial DNA. These mutations can result from exposure to toxic chemicals, infections, inflammation, and nutritional deficiencies. Mitochondria are important in all cells in the body, but are especially important to organs that utilize large amounts of energy, such as the muscles, heart, and brain. The mitochondria also have several other important functions in the cell, including steroid synthesis, calcium regulation, free radical production, and the induction of apoptosis or programmed cell death, all of which are involved in the pathogenesis of numerous disorders. The marker used in the GPL-TOX profile indicates mitochondrial dysfunction by monitoring a metabolite that is elevated in mitochondrial deficiency of cofactors such as NAD+, flavin-containing coenzymes, and Coenzyme Q10. Disorders associated with mitochondrial dysfunction include autism, Parkinson's disease, and cancer. 2-Methylhippuric Acid (2MHA), 3-Methylhippuric Acid (3MHA), 4-Methylhippuric Acid (4MHA) These are metabolites of xylenes, solvents found in paints, lacquers, cleaning agents, pesticides, and gasoline. Exposure to xylenes generates methylhippuric acid isomers. Avoid/reduce exposure to these substances. Exposure to environmental styrene may slightly increase phenylglyoxylic and mandelic acid. Reduce exposure by eliminating the use of plastic and styrofoam containers for cooking, reheating, eating, or drinking. Elimination of styrene can be accelerated by supplementing with glutathione and N-acetyl cysteine (NAC). 2,4-D was an ingredient in Agent Orange, and is most commonly used in agriculture treatment of genetically modified foods, and as a weed killer for lawns. Reduce exposure by eating organic foods and avoiding use of pesticides in your home or garden. NAE is a metabolite of acrylamide, which is detoxified through a two-step process. First, acrylamide is metabolized by the cytochrome P450s. Second, it is conjugated to glutathione in order to make it more water soluble. Acrylamide is used in many industrial products and processes such as plastics, food packaging, cosmetics, nail polish, dyes, and treatment of drinking water. High levels of acrylamide can elevate a patient's risk of cancer and can cause neurological damage. Supplementation with glutathione can assist in the elimination of this compound. Perchlorate is used in the production of rocket fuel, missiles, fireworks, flares, explosives, fertilizers, and bleach. Studies show that perchlorate is often found to contaminate water supplies and food sources. It can disrupt the thyroid's ability to produce hormones. The EPA has also labeled perchlorate a likely human carcinogen. Patients with high exposure to perchlorate can use a reverse osmosis water treatment system to remove perchlorate from their water supply. NADB is a metabolite of 1,3 butadiene, which is evidence of exposure to synthetic rubber such as tires. 1,3 butadiene is a known carcinogen and has been linked to increased risk of cardiovascular disease. Individuals that come into frequent contact with rubber could absorb 1,3 butadiene through the skin. NACE is a metabolite of acrylonitrile, which is used in the production of acrylic fibers, resins, and rubber. Acrylonitrile is metabolized by the cytochrome P450s and then conjuagated to glutathione. Supplementation with glutathione should assist in the detoxification of acrylonitrile. Once a positive test is identified, there are things you can do to help your body eliminate the toxins and to prevent future exposures. The first steps to reducing the amount of toxins present in the body are to switch to eating only organic food and drinking filtered water that is free of common toxins, including pesticides. Most conventional food crops are exposed to larger and larger doses of pesticides and herbicides, and by switching to organic you will prevent exposure to hundreds of these toxicants. Many of these chemicals have also contaminated our water supplies. Installing a high-quality water filtration system in the home that eliminates them is important to do and there are several options available. The next step to avoiding future exposures is to change the products you use on a daily basis, from food and beverage containers to beauty and cleaning products. Instead of using plastic water bottles and food containers, switch to glass or metal. Never microwave food in plastic or styrofoam containers and do not drink hot beverages from plastic or styrofoam cups. Make sure your shampoo, soaps, lotions, and other beauty products are free of phthalates. Use cleaning products made from natural ingredients or make your own at home. To eliminate toxins from the body, we highly recommend exercise and the use of saunas, especially infrared sauna therapy to expel many chemicals through sweat. Infrared sauna is superior to conventional sauna because it reaches deeper into the body, increasing the circulation in the blood vessels, and causing the body to start releasing many of the chemicals stored in body fat. There are many factors that affect the body's ability to eliminate toxins. At the Balanced Body Center, our doctors will help identify the toxins and create customized programs to help each patient choose the appropriate nutritional products, as well as come up with a plan for the dietary and lifestyle changes required to help the detoxification process.